Rader + Crews designed the new landscape for this existing New York City primary school located in the Bronx that was being renovated and receiving a new addition. We designed an entry plaza that directs students and visitors to a new building entry point while providing a secure zone for gathering. The remainder of the site is zoned for a wide variety of activities and learning opportunities. There is a large play yard that has overlaid figures painted on its surface including class queuing circles, sport courts, a running track, a world map and direction compass, and a solar system drawn to scale. 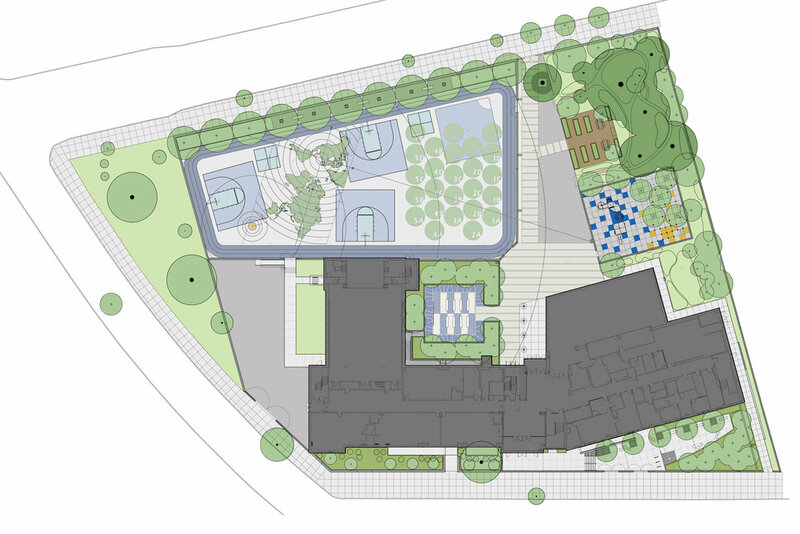 A playground for kindergarten and first graders has a large play structure and a zone that is planted with trees interspersed with a grid of vertical poles encouraging freer play where the children can invent their own games. An activity courtyard with chalkboard provides an outdoor classroom and a place for organized activities. The children’s garden serves as a laboratory where children can experience natural processes close-up and an existing stand of large mature trees is under planted with indigenous species to form a native plant garden. Overlaid on these elements is a queuing area and entry walk that accommodates the student morning arrival process.